You may think of teen comic hero Archie as a “nostalgia brand,” but a fresh look and edgier stories he is being updated for a new generation of readers. 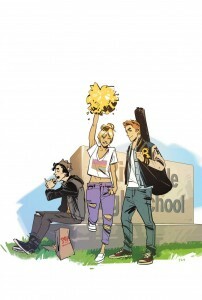 Over the past seven decades, the comic book hero Archie and his gang of friends — Jughead, Veronica, Betty, et al. — have become classics. The beloved high-school and teen comic book is just the sort thing that you might remember having read while you waited in the back of your mom’s Oldsmobile, your bare legs sticking to the hot vinyl, with the windows cracked to let out the summer heat, sipping a Tab through a straw, while your mother popped into the corner store to pick up a pack of smokes. 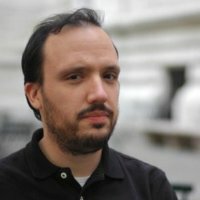 Hear Alex Segura on the relaunch of Archie at our March 26 conference, Designing Books for Millennials. “But Archie has not been frozen in amber for 75 years,” says Alex Segura, Senior Vice President of Publicity and Marketing for Archie Comics. He has hung out with the band KISS, fought zombies, married both Veronica and Betty (in alternate story lines), and even died. But he’s coming back this July, relaunched for a new generation. “Archie stared off with a bit of an edge, but has been somewhat neutered over the past decades. We’re returning that edge. If classic Archie is Saturday morning TV, then this is prime time,” says Segura. Archie #1, hipper than before. The comic book series, which has reached 600+ issues, will be re-issued at #1 — a big deal in the comic book world. “We’ll be using classic elements of Archie to revive the brand and telling his origin story for the first time as well. It will still be a comedy, but with a more YA focus. All of which is not to say that the Archie comics haven’t tackled potentially controversial issues before: Segura notes that Archie was “the first comic book to feature a gay wedding” — when Archie’s friend Kevin Keller got married his long-term boyfriend. Instead, the challenge is to reach a new generation of millennial readers with content that will appeal to them, all the while without turning away the stalwart Archie fan who has stuck with the brand through decades. 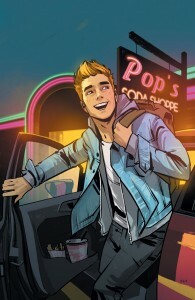 Archie #1, the gang reborn.